William Durham's Headstone. Image available on the Internet and included in accordance with Title 17 U.S.C. Section 107. 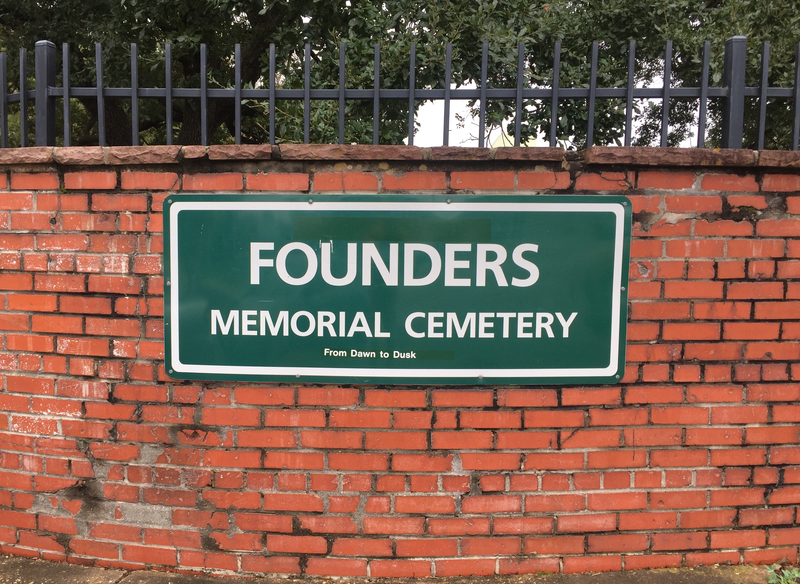 Old Founders Memorial Park, now Founders Memorial Cemetery. Image available on the Internet and included in accordance with Title 17 U.S.C. Section 107. DURHAM, WILLIAM DAVIS (1815–1838). William Davis Durham, soldier, was born at Bardswell, Norfolk, England, on July 4, 1815, the eldest of seven children of William and Ester (Bloomfield) Durham; he was a brother of George J. Durham. The family immigrated to the United States in 1833 or 1835 and settled in New York. William enlisted in the New Orleans Greys on October 22, 1835, and landed at Velasco, Texas, three days later. As a member of that unit he participated in the siege of Bexar. When the Texas army split, Durham marched to the east and fought at the battle of San Jacinto. His name is engraved (incorrectly, as William Daniel Durham) on the face of the San Jacinto Monument. He died, a victim of a yellow fever epidemic, in Houston on August 27, 1838, and was buried in Old Founders Memorial Park. In 1936 the state placed a monument over his grave. 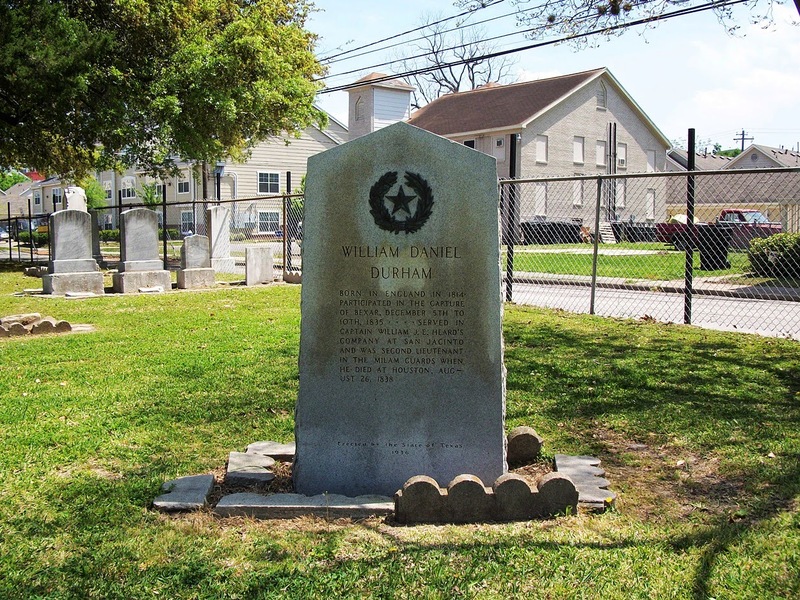 A man named William Durham received 1,280 acres from the Republic of Texas secretary of war on May 30, 1838, for his service from October 1835 to October 1836 and was awarded 1,280 acres in Goliad City on February 27, 1841. Daughters of the Republic of Texas, Muster Rolls of the Texas Revolution (Austin, 1986). Sam Houston Dixon and Louis Wiltz Kemp, The Heroes of San Jacinto (Houston: Anson Jones, 1932). Louis Wiltz Kemp Papers, Dolph Briscoe Center for American History, University of Texas at Austin. Thomas L. Miller, Bounty and Donation Land Grants of Texas, 1835–1888 (Austin: University of Texas Press, 1967). Handbook of Texas Online, Charles Durham Gouldie, "DURHAM, WILLIAM DAVIS," accessed April 25, 2019, http://www.tshaonline.org/handbook/online/articles/fdu25.